A new rapid yeast and mold test method for dairy applications, such as yogurt, soft cheese and cream, can dramatically improve speed-to-market and reduce economic impact from spoiled product. GreenLight® detection platform from MOCON, Inc. reduces testing times by up to 80 percent, enabling dairies to release product in approximately 18 hours with confidence that it does not contain yeast/mold spoilage organisms. “Because traditional agar plate methods require as long as five days to deliver yeast and mold detection tests results, dairy products typically have already entered the distribution channel. Positive results can trigger a product recall, which can negatively impact the corporate bottom line and brand image. With GreenLight’s significantly shorter test cycle, it becomes more feasible for dairies to hold product onsite until test results are received. Should results come back positive, no recalls are necessary,” explained Alan Traylor, business manager, microbial detection. The rapid testing capability can also serve as an early warning that there is an issue with either the packaging line or the package structure, itself. For example, if a yogurt container hasn’t been correctly sealed, it can create a hospitable environment for mold growth. The new capability is possible due to a new formal test method MOCON has developed for its GreenLight platform. The test methodology has been validated by Professor Lubomir Valik, Ph.D. of the Slovak University of Technology, Bratislava, Slovakia. 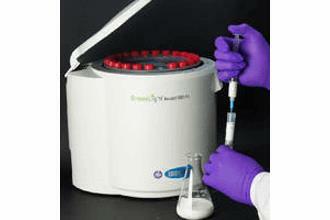 GreenLight instruments have traditionally been used to rapidly screen for the presence and number of aerobic microbes. The new test method augments its ground-breaking capabilities in total viable count (TVC) and “indicator organisms” for bacteria, using its oxygen-depletion sensor and automated reader. GreenLight achieves results for yeast and mold using the same automated reader and unique APCheck™ oxygen sensing vials as for bacteria. The user simply adds a commercially available selective media to the vial. This means that yeast or mold testing becomes even more efficient because initial sample preparation is reduced. The GreenLight system can then be loaded with mixtures of bacterial and other tests at the same time and controlled automatically. Laboratory personnel also benefit from shorter preparation times due to the elimination of multiple dilutions. The simplified preparation process reduces costs and decreases the chance of lab error. Additionally, since GreenLight’s “objective” test protocol does not rely on plate counting, errors are further reduced while quantitative information is saved to a secure database for statistical process control or trend analysis.